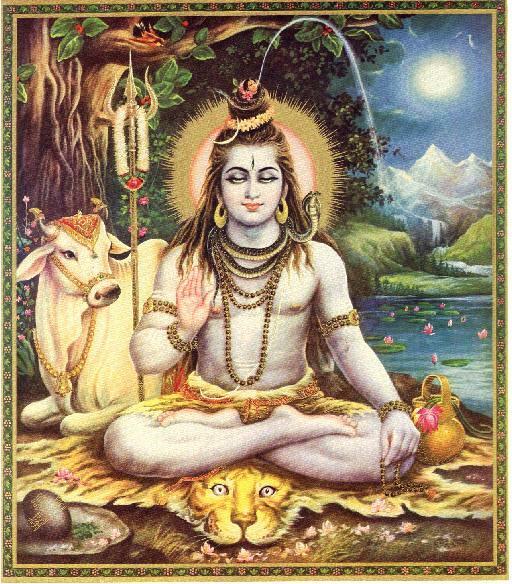 What is the Position of Lord Shiva? Madhudvisa: Prabhupāda? What is the position of Lord Shiva? Prabhupāda: Lord Shiva is a demigod, but he is higher than all other demigods. He’s higher than Lord Brahmā also. But he’s not the Supreme Lord. Just like there are different gradations. That is not difficult to understand. In society also, there are different gradations. Similarly, the living entities, there are different gradations. Some of the living entities are situated in higher planets, some of them are situated in lower planets and some of them are situated in high-grade life and some in low-grade life. So the demigods are also living entities, but they are enjoying better standard of life due to their acts of piety. But Lord Shiva is not amongst the living entities. He’s above the living entities but he is counted as one of the demigods. But his position is better than Lord Brahmā even. Brahmā is said to be the highest living entity within the universe, and Lord Shiva’s position is higher than that of Lord Brahmā. 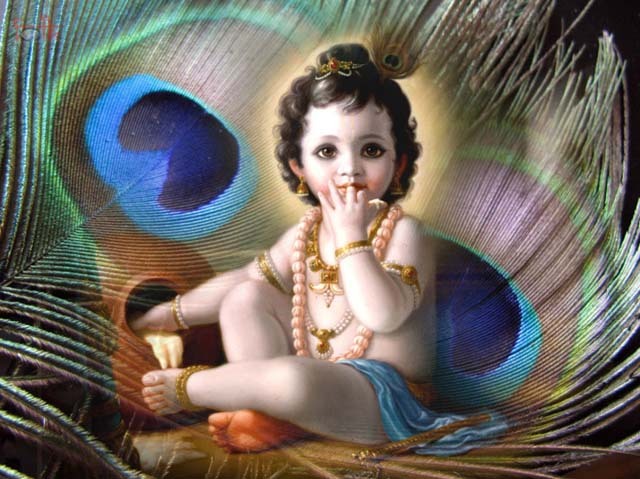 So…continuining our month long attempt to stay focused on the childhood pastimes of Krsna, during this month of Damodara (Kartika), we bring you another exciting chapter from; Kṛṣṇa, the Supreme Personality of Godhead. 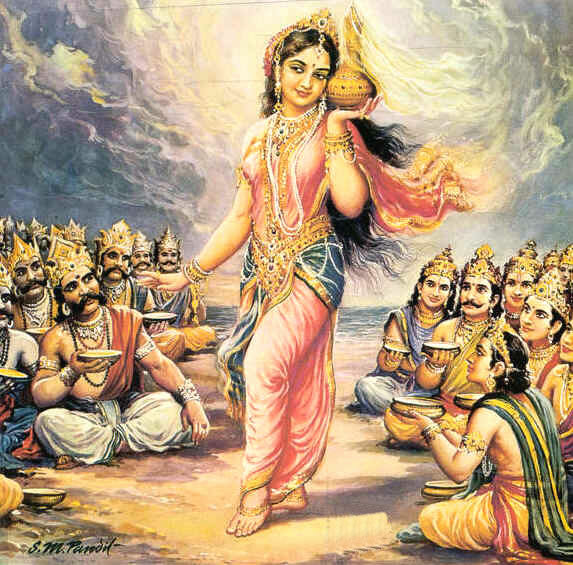 Today we are posting the chapter entitled “The Deliverance of Nalakūvara and Maṇigrīva”. 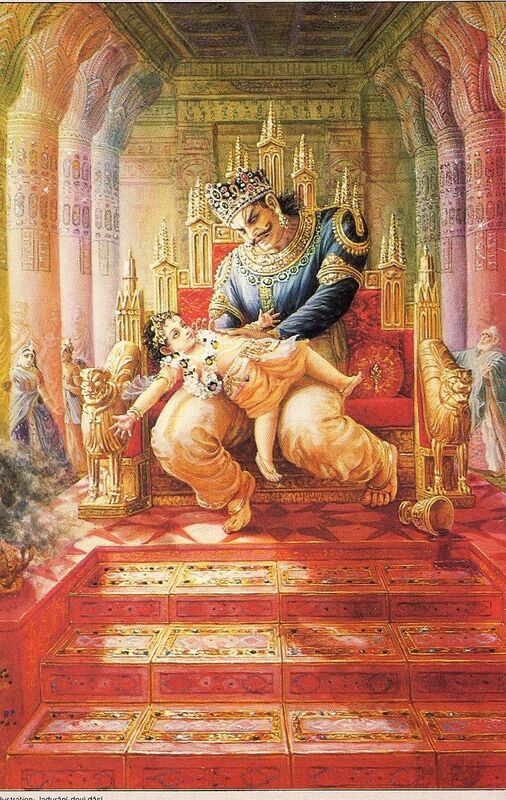 The story of the cursing of Nalakūvara and Maṇigrīva and their deliverance by Kṛṣṇa, under the all-blissful desire of the great sage Nārada, is here described. 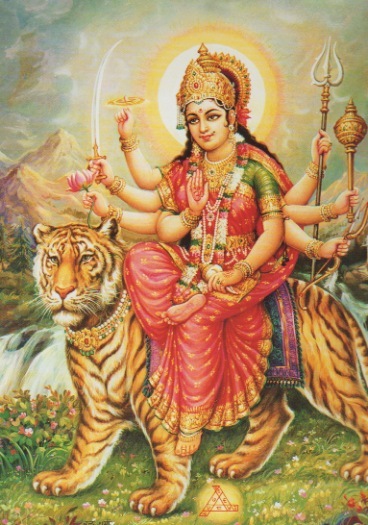 So just to make things a little clearer…both to myself and others, I did some research from Srila Prabhupada’s books to find the proper understanding of Goddess Worship, or worship of the demigods. 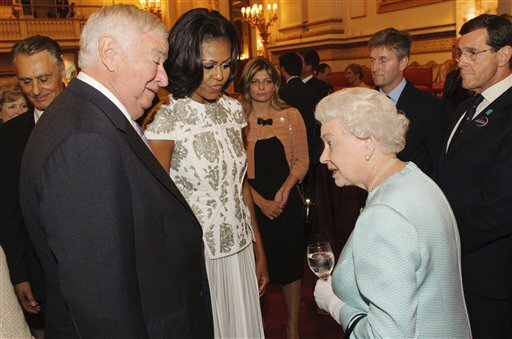 …Everyone thinks that his intelligence is perfect. Sometimes one employs his intelligence in the worship of Umā, the wife of Lord Śiva, in order to obtain a beautiful wife. 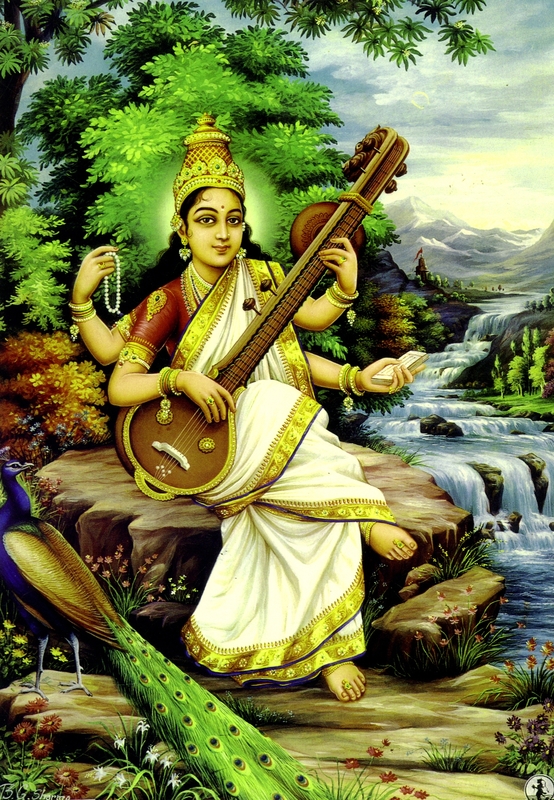 Sometimes, when one wants to become as learned as Lord Brahmā, he employs his intelligence in the worship of the goddess of learning, Sarasvatī. 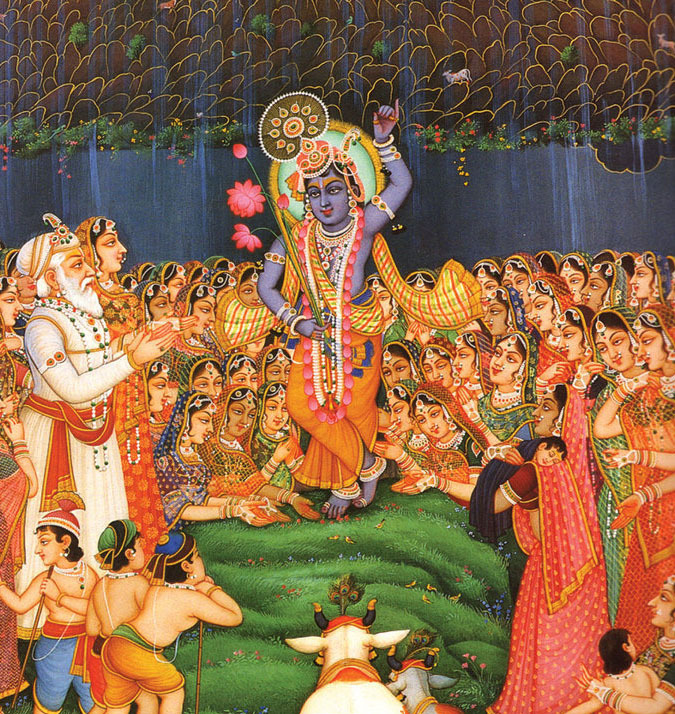 Sometimes, when one wishes to become as opulent as Lord Viṣṇu, he worships the goddess of fortune, Lakṣmī. 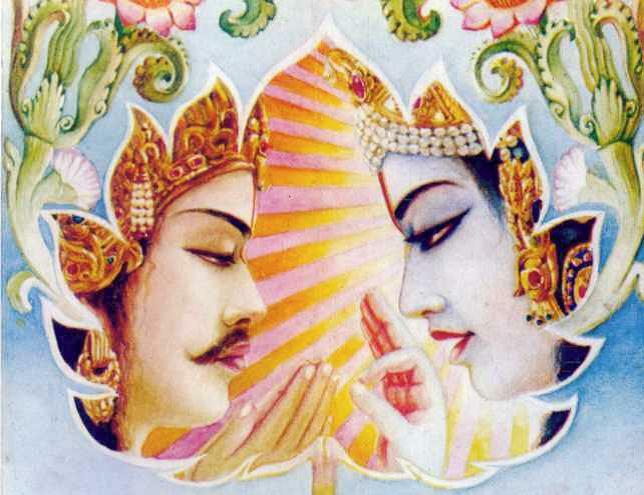 This morning I was reading Chapter Two in the Krsna Book, the chapter entitled “Prayers by the Demigods for Lord Kṛṣṇa in the Womb” and I was reminded of this above image from the Tenth Canto of Srimad Bhagavatam, that I like very much. So I thought I would share this image with you, along with the brief chapter description. Hare Krishna! I like this picture very much and it became my meditation this morning. I began to think what it was, that first attracted me to Srila Prabhupada and the Hare Krishna Movement, or Krsna Consciousness. And it was the idea of becoming a better person, that first attracted me. On this very auspicious day, Govardhana-puja, we are reminded of Krsna’s lifting of Govardhana Hill, as told by His Divine Grace A.C. Bhaktivedanta Swami Prabhupada in chapter 25 of the Krsna Book. …Kṛṣṇa has declared in the Bhagavad-gītā that the worshipers of the demigods are not very intelligent. 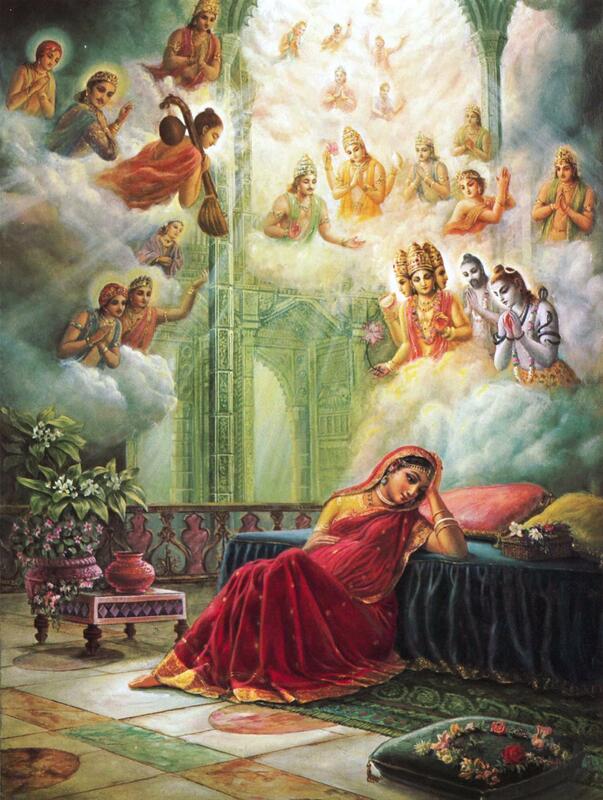 He has also declared that one has to give up all kinds of worship and simply concentrate on Kṛṣṇa consciousness. Kṛṣṇa’s invoking the anger of Indra and later on chastising him is a clear indication to His devotee that those who are engaged in Kṛṣṇa consciousness have no need to worship any demigod, even if it is found that the demigod has become angry. Kṛṣṇa gives His devotees all protection, and they should completely depend on His mercy. “Like father like son,” the saying goes. So how was it that the most sinister personality ever to darken the universe fathered a great saint? Day by day, year after year, they grew more powerful, more evil, and more dominant over all the other demons, who made alliances with them. Then, under the direction of Hiranyaksa and Hiranyakasipu, the demons set out to conquer the demigods, their archenemies and the administrators of the universe. In their war for universal power, the demons enjoyed many victories, but at last Lord Visnu [Krsna] Himself killed Hiranyaksa. His brother’s death overwhelmed Hiranyakasipu with grief and rage. He bit his lips and gazed upward with eyes whose blazing anger filled the sky with smoke. He took up his trident, glanced around fiercely, bared his terrible teeth, and began to speak to his demon friends. The following is from the Srimad Bhagavatam, Eight Canto, Chapter Nine, entitled “The Lord Incarnates as Mohinī-Mūrti”. The full chapter follows this beautiful verse from preceding chapter. Because of the Supreme Lord’s assuming the form of a beautiful woman to arouse the lusty desires of the demons, a description of Her complete beauty is given here. 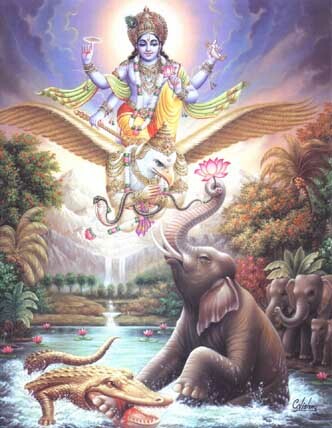 The Fourth Chapter of the Eight Canto of Srimad Bhagavatam describes the previous birth of Gajendra and the crocodile. It tells how the crocodile became a Gandharva and how Gajendra became an associate of the Supreme Personality of Godhead. …in his birth as an elephant, when he was dangerously attacked by the crocodile, he remembered his past life in devotional service and remembered a prayer he had learned in that life. Because of this prayer, he again received the mercy of the Lord. Śukadeva Gosvāmī ends this chapter by describing the good fortune of the elephant. Śukadeva Gosvāmī says that by hearing the narration of Gajendra’s deliverance, one can also get the opportunity to be delivered. A devotee who tolerates everything in this material world and patiently executes his devotional service can become mukti-pade sa dāya-bhāk, a bona fide candidate for liberation. The word dāya-bhāk refers to a hereditary right to the Lord’s mercy. A devotee must simply engage in devotional service, not caring about material situations. 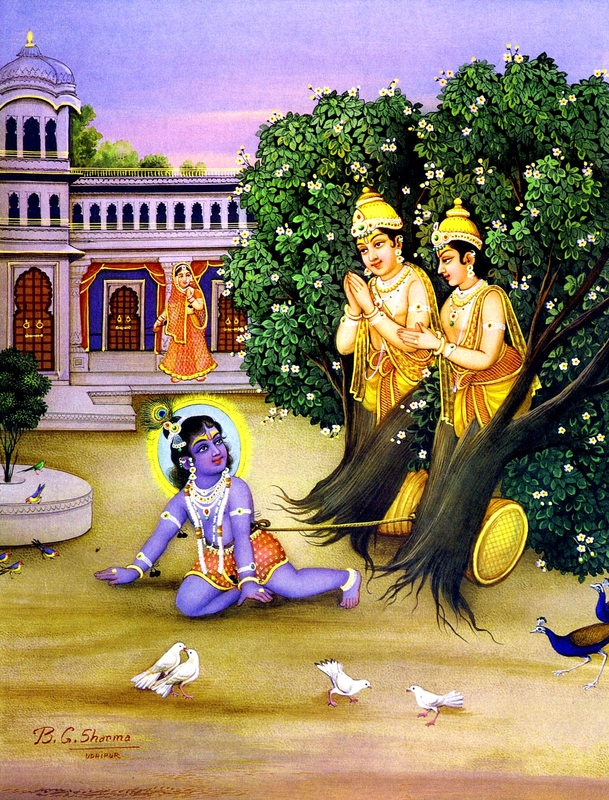 Then he automatically becomes a rightful candidate for promotion to Vaikuṇṭhaloka. The devotee who renders unalloyed service to the Lord gets the right to be promoted to Vaikuṇṭhaloka, just as a son inherits the property of his father. …The appearance of Kṛṣṇa is the answer to all imaginative iconography of the Supreme Personality of Godhead. Everyone imagines the form of the Supreme Personality of Godhead according to his mode of material nature. In the Brahmā-saṁhitā it is said that the Lord is the oldest person. Therefore a section of religionists imagine that God must be very old, and therefore they depict a form of the Lord like a very old man. But in the same Brahmā-saṁhitā, that is contradicted; although He is the oldest of all living entities, He has His eternal form as a fresh youth. 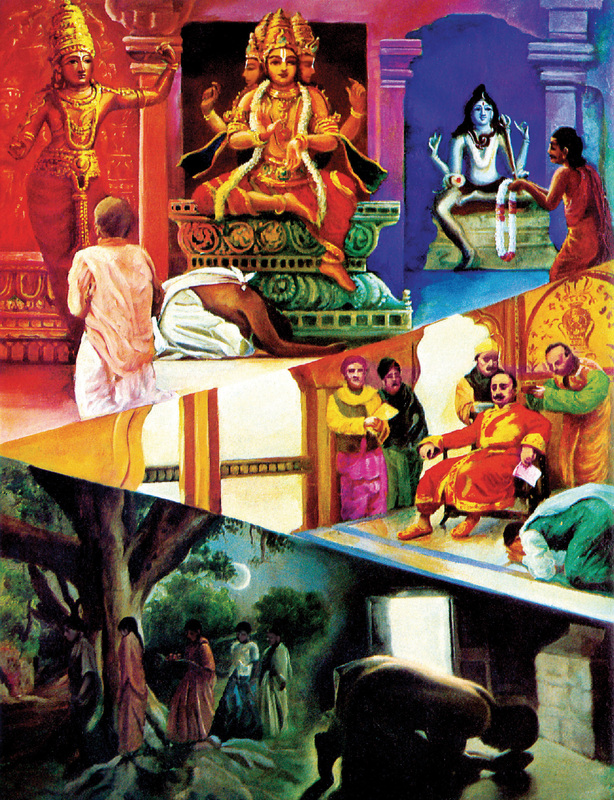 …”O dear Lord,” the demigods continued, “You are unborn; therefore we do not find any reason for Your appearance other than for Your pleasurable pastimes.” Although the reason for the appearance of the Lord is stated in the Bhagavad-gītā (He descends just to give protection to the devotee and vanquish the nondevotee), actually He descends for His pleasure-meeting with the devotees, not really to vanquish the nondevotees. The nondevotees can be vanquished simply by material nature. “The action and reaction of the external enregy of material nature (creation, maintenance and annihilation) are being carried on automatically. 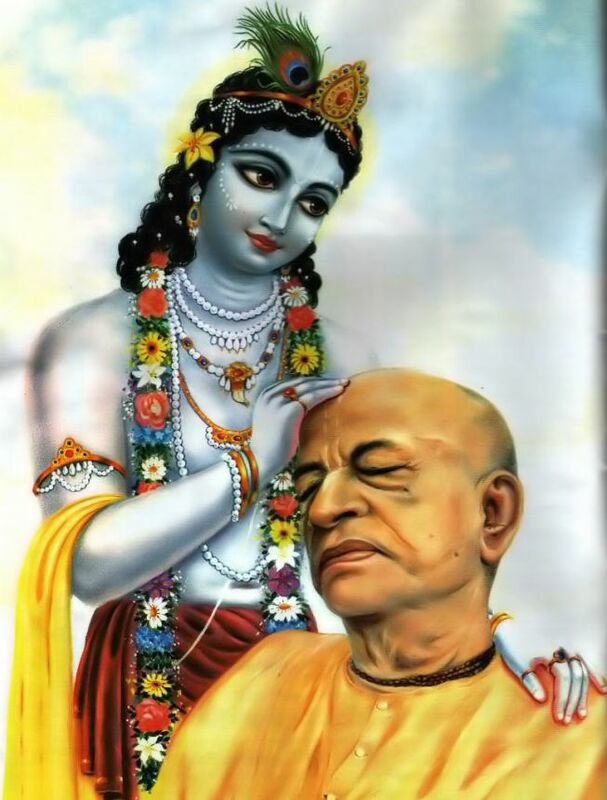 But simply by taking shelter of Your holy name–because Your holy name and Your personality are nondifferent–the devotees are sufficiently protected.” The protection of the devotees and the annihilation of the nondevotees are actually not the business of the Supreme Personality of Godhead when He descends. They are just for His transcendental pleasure. There cannot be any other reason for His appearance. …There are many powerful kings, leaders, learned scholars, scientists, artists, engineers, inventors, excavators, archaeologists, industrialists, politicians, economists, business magnates, and many more powerful deities or demigods like Brahmā, Śiva, Indra, Candra, Sūrya, Varuṇa and Marut, who are all protecting the interest of the universal affairs of maintenance, in different positions, and all of them are different powerful parts and parcels of the Supreme Lord. The Supreme Lord Śrī Kṛṣṇa is the father of all living entities, who are placed in different high and low positions according to their desires or aspirations. Some of them, as particularly mentioned above, are specifically endowed with powers by the will of the Lord. A sane person must know for certain that a living being, however powerful he may be, is neither absolute nor independent. All living beings must accept the origin of their specific power as mentioned in this verse. And if they act accordingly, then simply by discharging their respective occupational duties they can achieve the highest perfection of life, namely eternal life, complete knowledge and inexhaustible blessings. As long as the powerful men of the world do not accept the origin of their respective powers, namely the Personality of Godhead, the actions of māyā (illusion) will continue to act. The actions of māyā are such that a powerful person, misled by the illusory, material energy, wrongly accepts himself as all in all and does not develop God consciousness. As such, the false sense of egoism (namely myself and mine) has become overly prominent in the world, and there is a hard struggle for existence in human society. The intelligent class of men, therefore, must admit the Lord as the ultimate source of all energies and thus pay tribute to the Lord for His good blessings. Simply by accepting the Lord as the supreme proprietor of everything, since He is actually so, one can achieve the highest perfection of life.